I have a friend (who has since moved away–sadness) who was incredibly talented and filled her home with creative paintings featuring florals, people and different quotes and Bible verses. I used to babysit her three little girls, so I saw these pieces of art all the time, and was eventually inspired to create some of my own. Little-known fact: As a child, I wrote/colored/drew/painted up a STORM, although I never considered myself particularly gifted. It’s always been my dream to one day write a novel, but that’s been shelved in order to pursue other interests, including nutrition and fitness, right now. One day. Maybe. Anyway. A few months ago, I took a trip to Hobby Lobby and picked up some supplies to create some ‘art’ of my own. I started with a blank corner of our kitchen island countertop. It faces the TV room but since we eat most of our meals sitting across from each other at that countertop (Andrew in the TV room, me in the kitchen), it seemed like an appropriate place for a food-themed piece. 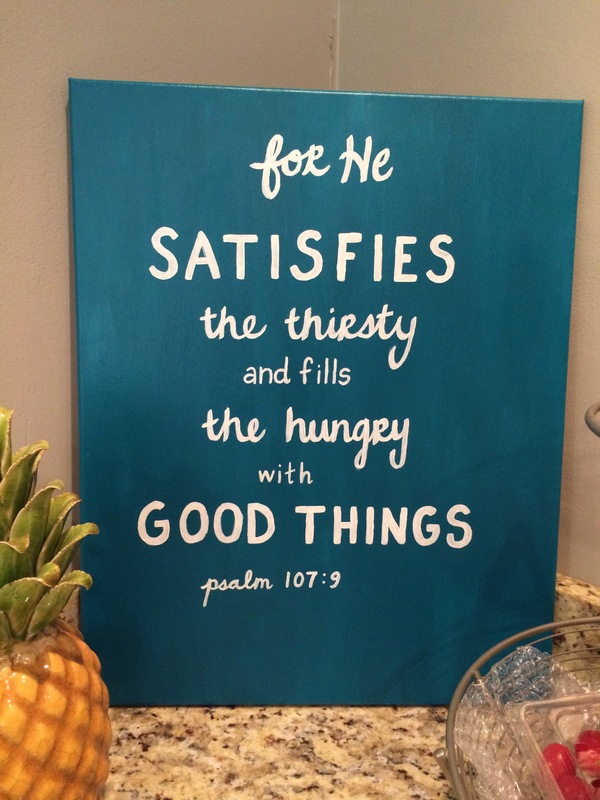 I knew I wanted to create something that would inspire me to eat healthy food in a healthy way, which is why I chose Psalm 107:9. The only challenge was that the teal was so dark, I couldn’t see any pencil marks, so I had to free-hand the entire thing. I think it turned out rather well, despite feeling terrified I was going to spell something wrong the entire time! 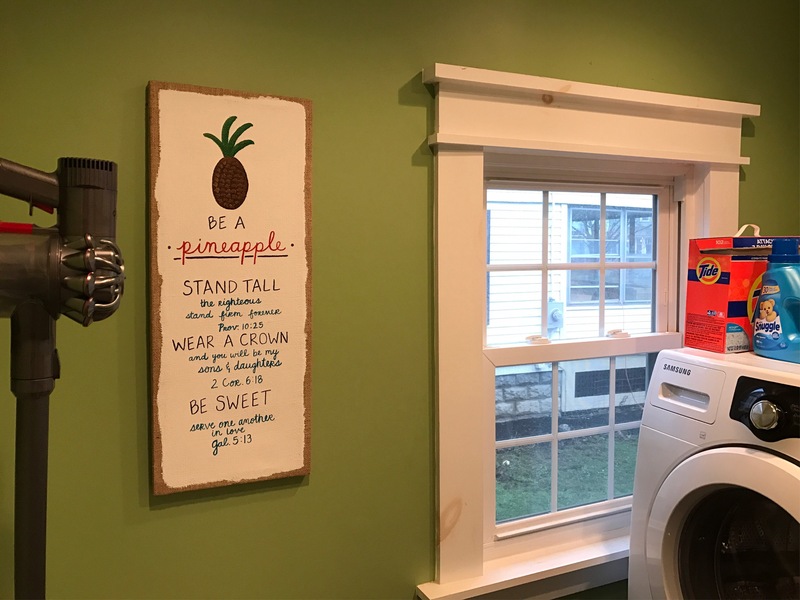 My second project (click for a larger photo) is in the laundry room and I was inspired by different things I’d seen in stores and online lately. Pineapples are so hot right now–I must be a trendsetter. The quote is: ‘Be A Pineapple: Stand Tall, Wear A Crown, Be Sweet.’ Again, I thought I could embellish with Bible verses, so I found different ones that were appropriate for each portion of the quote. My last piece is in the kitchen itself, and another food/Bible-themed project. 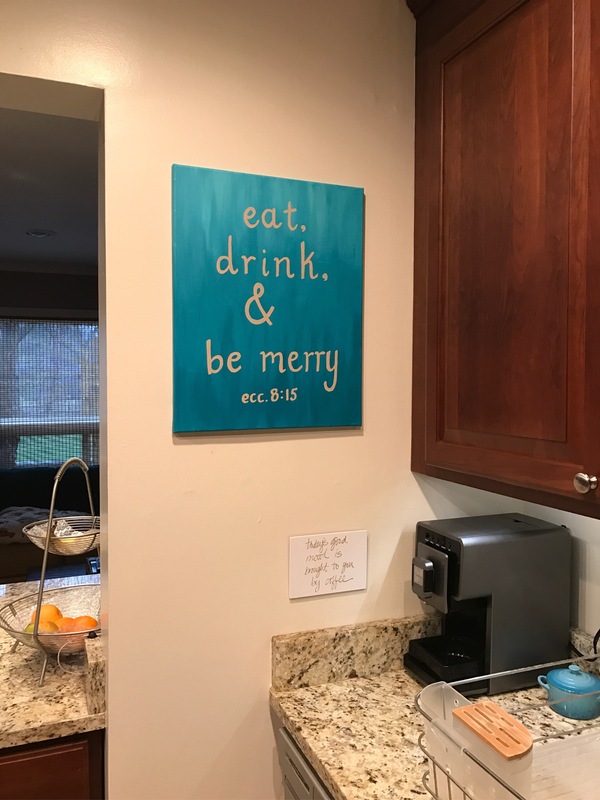 Who knew ‘eat, drink and be merry’ is from the Bible?? I didn’t. I made this canvas a gradient with lighter colors on top, and made the text color match the beige of our walls. I can’t say I’m in love with any of the pieces, but I’m happy with how they turned out and like having my own original ‘artwork’ on my walls instead of generic items purchased at big-box stores. That’s how Andrew and I decorate anyway, mostly with photos or maps or other items that harken back to our European travels. In fact, we have some maps being framed right now for our bedroom!